From 24 April to 28 April, 2017 at Inter Expo Center will be held the 16th edition of TechnoMebel exhibition. 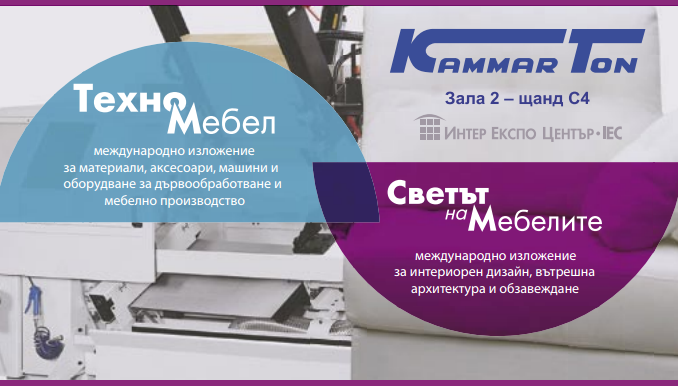 This year, the stand of Kammarton Bulgaria will be built thematically: "The Road of the Product". We will start with the RAPID torches and pistols and APACH pneumatic pistols, powered by compressors CompAir and BAMAX, with CEJN polyurethane spiral hoses. We will go through the use of Hermankoll and QS ADHESIVOS adhesives, SAYERLACK varnishes, BOGH kits, EKAMANT sanders and GRACO paint systems. And we will finish - the packing with various machinery and equipment for from brands JOSEF KIHLBERG, STRAPEX, NOXON and MARIPAK and the lifting and the moving with PRAMAC carts and TAWI vacuum systems. We invite all of you, customers and partners in the furniture and woodworking industry to visit us - Hall 2, stand C4. The visitors' registration for free entrance directly to this link: REGISTRATION.